Nevada DOT’s Sondra Rosenberg (right) is shown here with Michael Kies, Arizona DOT Assistant Director, Multimodal Planning. 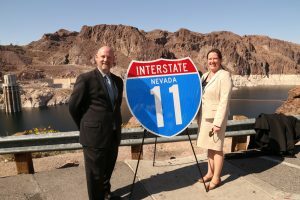 Rosenberg and Kies served as co-project managers on the I-11 & Intermountain West Corridor Study. 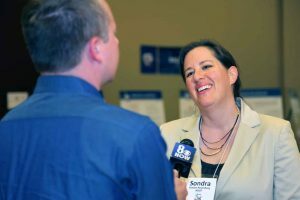 As the Assistant Director for Planning for the Nevada Department of Transportation (NDOT), Sondra Rosenberg, M.S., Transportation Technology and Policy (TTP), 2005, is making a difference and playing a significant role in the public sphere. Rosenberg has been managing and actively participating in transportation and research projects with NDOT since 2008. She coordinated the multi-state Interstate-15 mobility alliance, and played a major role in the development of Interstate 11. With her promotion to the Assistant Director position in September 2014, Rosenberg supervises several departmental divisions, including Multimodal Planning and Program Development, Transportation Data, Traffic Safety and Performance Analysis. She is also in charge of coordinating project funding, grant opportunities and represents NDOT on national committees and conferences. Prior to landing at her current public agency, Rosenberg explored a lot of alternative career options. After finishing her degree in physics, Rosenberg decided that she preferred work that had a more direct connection to people’s lives. She intended to study energy policy when she enrolled at the UC Davis Institute of Transportation Studies (ITS-Davis) but soon discovered her passion in transportation policy. ITS-Davis’ unique transportation research program puts dual focus on policy and engineering, which Rosenberg found a bit challenging to explain when she first started applying to jobs after finishing her degree. After receiving her master’s degree, Rosenberg worked from 2004 to 2008 at Fehr and Peers, a firm that provides transportation and planning services to public and private sector clients. She then served as a National Parks Transportation scholar, before joining NDOT. Rosenberg still keeps in contact with peers and faculty from ITS-Davis, and finds herself constantly bumping into colleagues at meetings in Washington D.C. or at conferences all over the country. In addition, Rosenberg has recently reached out to ITS-faculty members Dan Sperling and Susan Handy to recruit students into vacant positions at NDOT. ITS-Davis students are a great fit, she adds. Rosenberg’s experience at ITS-Davis, coupled with her competence and determination, enabled her to be promoted to her current position at NDOT much sooner than she had expected. The #AggiesAtWork series is done in partnership with the UC Davis Cal Aggie Alumni Association.